Paris is one of our favorite cities to visit. 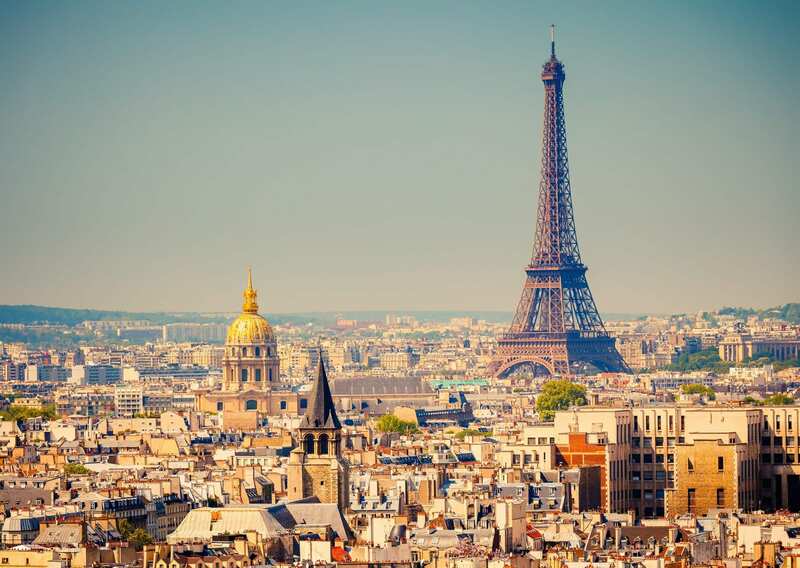 If you are traveling near France, we recommend making some time to visit this charming city. There is much to see, but we narrowed it down to our favorite can’t-miss sites for the ultimate 48 hours in the City of Lights. With only 48 hours, you want to get up and out of your hotel room early! Start your morning with breakfast at Cafe de Flore. It’s the oldest coffeehouse in Paris, so you’ve likely seen a lot of breakfast posts on Instagram from this spot. Order a cup of chocolat chaud (hot chocolate) or coffee, a croissant with some jam, and watch Parisians frolic through the city as Paris starts her day. Next, walk to the nearby Jardin du Luxembourg and stroll through the park, orchards, and rose garden. Make your way north toward the Pont de l’Archevêché. This bridge is behind Notre Dame, and thus it’s a very popular spot for photos. The bridge leads to a cobblestone pathway along the Seine, giving you a breathtaking backdrop of the famed Parisian cathedral. You may have seen this bridge covered in “love locks” not too long ago (they have since been removed). Head inside the Notre Dame Cathedral and prepare to be astounded by the incredible architecture. Then it is a quick 5-minute walk to Sainte Chapelle, a royal chapel in Gothic-style. As you enter Sainte Chapelle, you’ll be immediately stunned by the beautiful stain glass windows throughout the church. Across the street, take a quick peek inside the very quaint Shakespeare and Company. This bookstore is the oldest in France! From here it is a quick 10-minute walk to the Latin Quarter where you can stop for a glass of wine with excellent bread and cheese. If you did not make it to Cafe de Flore for breakfast this morning, it’s not too far from the Latin Quarter and open for lunch and dinner. Next, hop on the Metro (much faster and cheaper than Uber or a taxi in Paris) and head toward the Louvre. You can’t come to Paris and not visit the Louvre! I’d purchase your tickets in advance to avoid the long line you’ll inevitably come across at any time of day to get in. After viewing the famous Mona Lisa, take another wine break at L’Ecluse Saint-Honoré. Finally, stroll through the Jardin des Tuileries at sunset before it’s time to get ready for dinner. We highly recommend Le 39V near the Champs-Élysées. It’s a bit pricey, but the food and views are unbeatable. You can even catch a glimpse of the Eiffel Tower from the patio! It’s the perfect ending to a perfect first day. Breakfast should most definitely be had at Angelina’s. Indulge in the Angelina Breakfast option with hot chocolate. Then, hop on the Metro to Montmartre, which is our owner Lori’s favorite area in Paris. After that, get off at Lamarck/Caulaincourt station and head toward La Maison Rose. Next, pay a visit to the towering Basilique du Sacré-Cœur and overlook the sprawling city down below. After taking in the sights of the city, start down the famous steps at Square Louise Michel and walk towards Le mur des je t’aime. This is also another highly popular spot for photos next to one of the most amazing creperies in the city—Crêperie Brocéliande. Here they have savory and sweet crêpes that cannot be missed. Next, hop back on the metro and get off at Trocadéro station at the Palais de Chaillot. Cross the Jardins du Trocadéro and Pont d’Iéna toward the most famous landmark in all of Paris—the Eiffel Tower. Save precious time by buying your tickets online in advance to enjoy the birds-eye view of Paris from both viewing levels. Try taking the stairs down—it really is a trip! If you chose to head to the Eiffel tower after leaving Montmartre, next check out the Arc de Triomphe for a spectacular view of the city. Then work your way back toward The Louvre for lunch at a place called Le Soufflé. After lunch, do some much needed retail therapy at Champs Elysses. After shopping, we suggest having dinner at L’Absinthe (if they are serving the vegetable risotto, GET IT!). If it happens to be a Thursday night, make sure to go to the Musée d’Orsay for a late night museum visit. The museum is open until 9:45 pm on Thursdays, so we highly recommend taking advantage of that! Again, buy your tickets online. Lastly, to finish off your night, head back to the Eiffel Tower and enjoy the twinkling lights. You can catch them for the first 10-minutes of each hour. If you weren’t in the mood for dinner at L’Absinthe, opt for a six-course meal on the second floor of the Eiffel. Our owners Lori & Kem dined here on their most recent trip to Paris and deemed it a once in a lifetime experience. It’s splurge, but incredible, and an ideal way to end an incredible trip to Paris. You will need to make reservations well in advance. If you happen to find some downtime or are looking for alternative activities to the ones we mentioned above, some of our other favorites in the city of Paris include visiting the incredible Palace of Versailles, cruising the River Seine, and Musee d’Orsay. Do you have any Paris favorites that we missed? Let us know in the comments! Call us today in order to book your own Paris getaway at 402-281-3022.